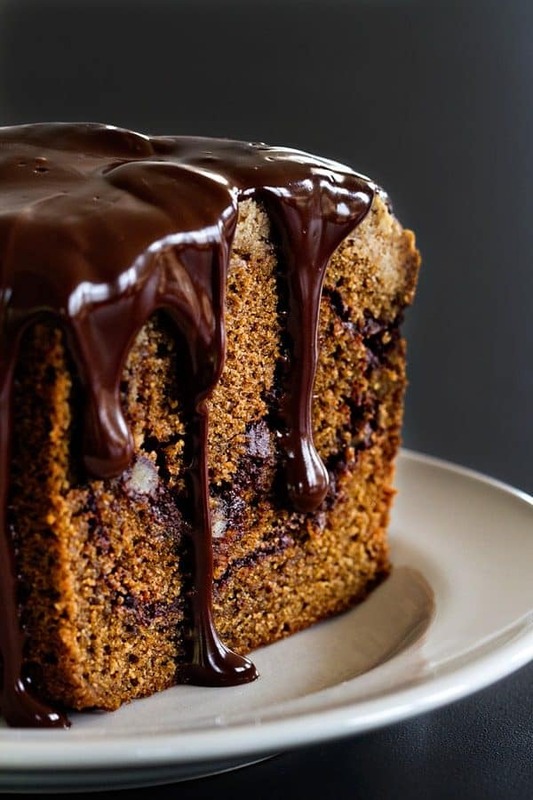 Mocha Coffee Cake is swirled with chocolate and topped with an espresso crumb topping. The Kahlua ganache makes it absolutely irresistible. If you’ve ever taken a few minutes to look at my recipe index, you know that my cake section is kind of lacking. It’s not that I don’t love cake because trust me, I love to eat cake, I just don’t always love to make cake. I have a few of my favorites like this recipe for The Best Chocolate Cake and this Pumpkin Crunch Cake that we make again and again. But every so often, I get the urge to step outside of my comfort zone and make something completely different. 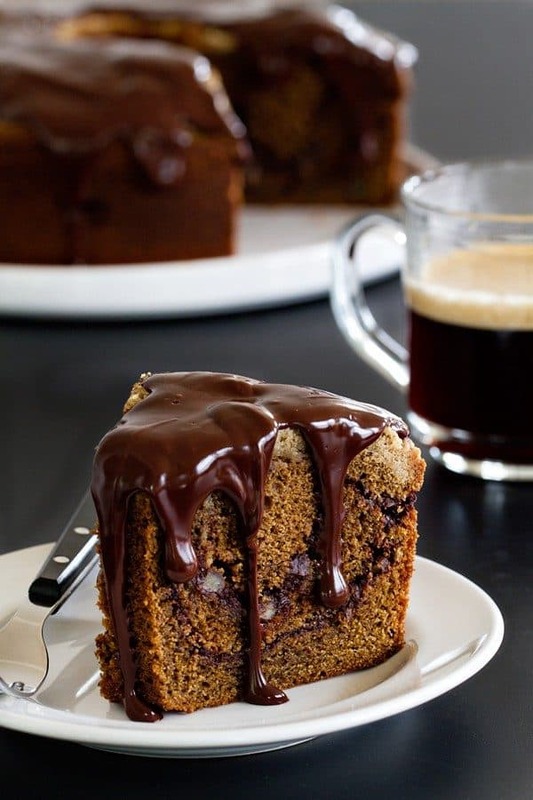 And that’s exactly what happened with this Mocha Coffee Cake. I came across this recipe last year on Epicurious and it immediately flew to the top of my must-bake list. In fact, I’ve made it several times since, and it never disappoints. But it definitely takes a little effort. Reading through the ingredient list might make you shy away at first glance, but I promise this Mocha Coffee Cake recipe is pretty simple once you break the steps down. It’s the perfect cake to bake up on a lazy fall afternoon when you have nowhere to be except the kitchen. 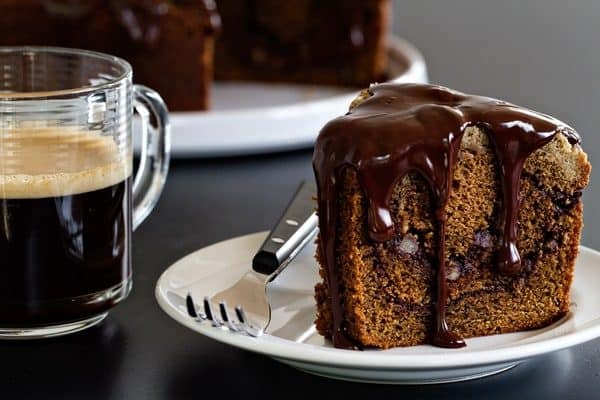 Mocha Coffee Cake starts with a delicious batter that includes cinnamon, cardamon and strong brewed coffee. The batter is layered with a scrumptious chocolate swirl and topped with an espresso crumb topping. 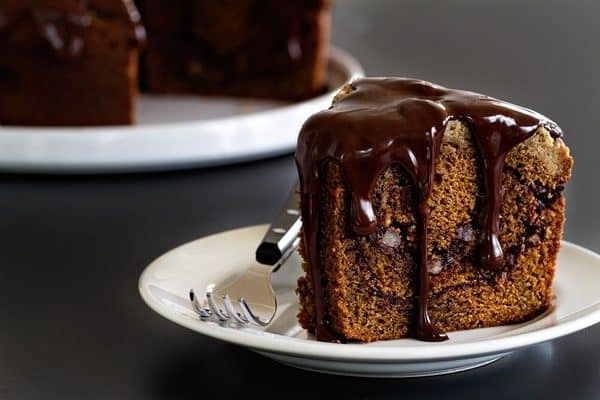 And if the mention of the crumb topping doesn’t have you scanning your pantry for the list of ingredients, how about the Kahlua ganache that gets drizzled over the cake once it’s cooled? I mean, this is one serious cake trifecta, and you’re going to love every single bite. Especially if you’re a chocolate and coffee fan. This cake, people. THIS CAKE. For more delicious cake recipes, be sure to check out this Caramel Apple Cake and this Date Cake here on My Baking Addiction. OMG the pictures are GORGEOUS!! Of course the recipe sounds amazing too!! Thank you so much, Brooklyn! Let me know how everyone likes it, Nikki! Hi, we don’t have all purpose flour where I live. Is it possible to substitute plain flour or self raising flour, and if so in what quantities please? Thanks! Hi, Dilani! Plain flour will be perfect, and you can use the same amount as the recipe calls for. I hope you enjoy it! Oh boy ! This is perfect! Photos are great too ! Happy cooking ! Thank you! I appreciate your compliments! I am drooling over this cake! That topping looks incredible! This looks fantastic. I’m at work and my mouth is drooling. Can’t wait to try it. Let me know how you like it, Fran! i do not drink. can you give me a sub for the kaluha?????? Hi, Mary! Feel free to add an extra tablespoon of heavy cream. I hope you enjoy it! WOW! amazing…i’m drooling just looking at the photo. I don’t have baking or cooking talent but I love food! Let me know how it goes, Al! The recipe isn’t showing up on my iPad. It’s just a lot of blank space where it would be. I tried clicking on your link to Epicurious, but it just takes me to a recipe for Coffee Coffee Cake. I tried searching the site and I can’t find it. Can you send me the recipe? I’d really love to try it. Thanks! Thanks so much for bringing this to our attention, we’ve fixed the glitch. It looks almost too good to eat, (almost). I would LOVE someone to make this for me! But that’s probably not gonna happen for me. Of course, I’d like to be there, cause I have a couple questions with the building the layers, crumb topping, etc.